Epiphany O´day has been laughed out of her University. 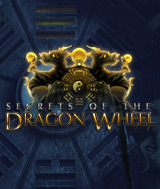 Her superiors think her wild theories on the ancient and mysterious Dragon Wheel Artifact are pure fantasy. But her mentor, Professor Lunn, has used her careful research to unlock dark forces and he begs her to help him before its too late. But powerful and evil people have taken notice of her work and now a trail of blood and ancient torment are forcing our beautiful, young sleuth to tangle with more than academia. She must sneak on to the Imperial Majestic, a luxurious and very dangerous royal train destined for an epic journey from Europe into the darkest reaches the Far East. She must use every ounce of her wits, bravery and deep knowledge of the Dragon wheel to stop the murder and Mayhem in its tracks. Comments: This is a great HOG with a good story line, liked it very much and hope I can find more like it.